What is the least number of riders you will take out? Any size group can be accommodated. However, if there is less than a total of 4 for a given trip, it may be subject to cancellation. Please call if you have any questions regarding your particular group. Cancellations made more than 24 hours before tour will be refunded. Cancellations less than 24 hours before tour will forfeit tour fee. The boat is designed to make pedaling as easy or difficult as the group desires. The boat is also equipped with auxiliary power that can be used at any time. There are no restroom facilities on board. Brief rain showers are not uncommon. In the event that rain is heavy, the Captain may elect to delay departure or cancel the tour. If the tour is canceled due to weather, a full refund will be given. The boat is Coast Guard inspected for safety compliance, and a life jacket is available for each passenger. Life jackets are not required to be worn during the tour. Can we jump off the boat for a quick swim or stop at an island to enjoy a quick bite to eat? As a general rule, each passenger must stay on the boat at all times. Private tours may arrange for swimming activities. The boat is piloted by a Captain holding the required Masters certification. “If you liked the trip, give the Captain a tip”. 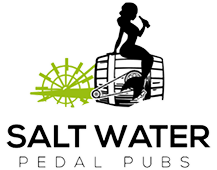 Can snacks or drinks be purchased from Saltwater Pedal Pubs? Food and beverage items are not available for purchase. Light “beer snacks” will be provided. You can bring any beverages and snacks you like. What do I need to do to plan a Special Tour? For Special tours, please call to make arrangements with one of our staff members or Click on Specialty Tours on our website and send us a contact form. One of our friendly staff members will contact you to set up your specialty tour. You may reserve a spot and pay online with credit card or Paypal. What if we want a longer tour than the scheduled 2 hr tour? Longer tours are available by prior arrangement and must be paid in full prior to departure.